Several conditions, including liver problems, systemic infection and cancer, can cause an enlarged spleen, but the most common cause of an enlarged spleen is the virus mononucleosis, according to the textbook "Biology: Life on Earth With Physiology." You should seek medical treatment if you have an enlarged spleen, and your doctor will advise you of the best treatment. Vigorous exercises and exercises such as situps that place pressure on the abdominal wall are generally not safe for people suffering from an enlarged spleen. The most serious complication of an enlarged spleen is rupture. This life-threatening condition results in internal hemorrhaging and typically requires surgical treatment, according to the "American Medical Association Family Medical Guide." With proper treatment of an enlarged spleen, rupture is very rare, with only 0.1 to 0.2 percent of patients experiencing this condition, according to the website Monotreatment. Rupture is often caused by a blow to the abdomen, but can also be caused by excessive stress and pressure on the abdominal muscles. 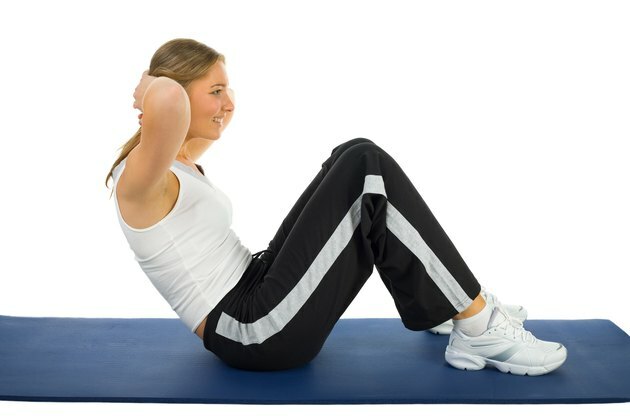 Situps and other abdominal exercises increase the risk of a ruptured spleen. You should avoid abdominal exercises until your spleen returns to its normal size. If your doctor recommends a full or partial splenectomy to treat your enlarged spleen, the "Mayo Clinic Family Health Book" advises that you should avoid all strenuous exercise, including situps, for six to eight weeks. In addition to increasing the risk of rupture, situps can also increase pain in the abdomen and slow recovery time. While vigorous exercise is not safe while your spleen is enlarged, light exercise can increase white blood cell count and strengthen your immune system. Light bicycling, walking and low-impact sports such as golf are generally safe choices, but you should consult your doctor before doing any exercise. When your spleen returns to its normal size, begin slowly building back up to your previous fitness routine. Try doing three or four situps for the first few days. If you experience any pain, stop exercising immediately. Your doctor can advise you about safe exercises and how long you must wait before returning to your normal exercise routine. Can Exercise Irritate an Ulcer?